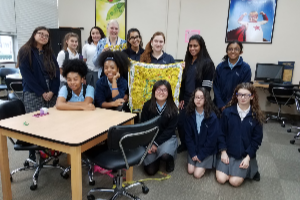 At the completion of the 2018 Seeds of Hope Youth Leadership Experience, participants were sent back to their schools and communities to implement a common service project: the creation of sleeping mats from “plarn” (yarn made from repurposed plastic shopping bags). At Immaculate Conception High School in Lodi, New Jersey, Seeds of Hope alumni Christina Roukas and Denise King, with the support of campus minister Sr. Marie Alexander Seigel, are hoping to complete 10 mats and distribute them at Mercy House in Newark, New Jersey, a resource center for homeless women. They are assisted by two school staff members, Faith Valentinetti and Joann Beatrice, who moderate a knitting and crocheting club that meets monthly with upwards of 24 participants. The Sisters in the convent are helping to make the plarn with the assistance of members of the Over 21 Program from the Felician School for Exceptional Children. This truly has become a community project. At St. Augustine High School in Laredo, Texas, the students leading the sleeping mat project have altered the method of creating the mats. They use a braiding method instead of knitting or crocheting, allowing more people to participate. 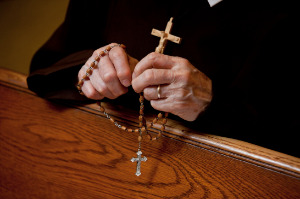 Pomona Catholic School in Pomona, California, has also adopted the braiding method. They have already completed one mat, which was given to a person in need. 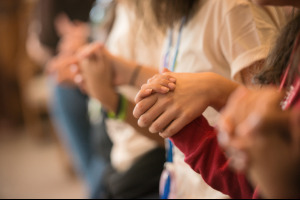 Limited spaces are still available for the 2019 Seeds of Hope Youth Leadership Experience, to be held June 16-22. 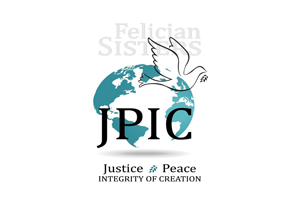 For more information, please contact Caroline Stanfill at cstanfill@feliciansisters.org or 724-650-7936.